At the inception of MYSUN, a good three years ago when the first thoughts came aloft, we set ourselves a challenge to solarize every rooftop possible in India. In our attempt to meet that challenge heads on, in the last year and a half or so we have held outreach programs in one way or the other across India. Some of these have been online some offline. However, it is the opportunity to meet the residential customers offline, hearing their problems, proposing a solution and completing the project has been the most critical component of our learning curve. It is this nature to put the demands of the customers first that has helped MYSUN grow into a reputable brand when it comes to rooftop solar. Continuing with our endeavour we held a pop up camp a couple of weeks ago in Nirvana Country in Gurgaon. Several hundred residents from the locality and the areas nearby attended and showed the keen interest in going solar on their rooftops. They recognized the potential of solar not just as a benefit to the environment but also what an amazing investment it can be. Who would not like to save 70-80% of their recurring monthly electricity bills? Top that with the easy financing options that MYSUN provides with MYSUN Flexi-Pay™ where you can virtually build your own payment terms and a promise to be with you for 25 years with the most comprehensive service and extended warranty package, MYSUN Assured™ and it is clear why several across the country are choosing MYSUN as their preferred solar partners. Several of our customers have shown really keen interest on the 12-month interest-free payment plan for MYSUN Flexi-Pay™. Our prime advice to the customers is using solar energy and save electricity. 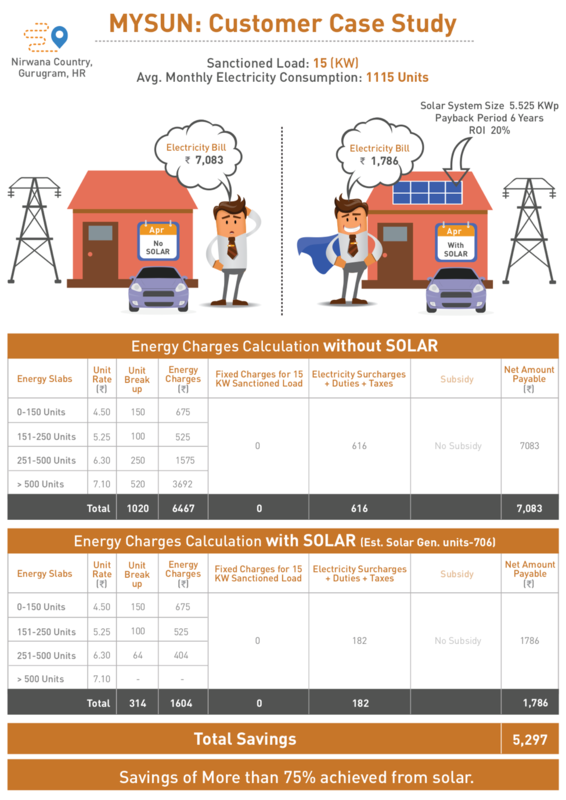 However, if you love your numbers and are looking to know the exact mathematics of the savings and how solar can be such a trusted investment, we prepared a case study for you from one of our customers in Nirvana Country in Gurgaon. Gurgaon being a strong residential area provides a great case study for residents wanting to go solar. As long as you have roof rights, there should be nothing stopping you from going solar in Gurgaon. It is extremely clear from the case study above that the resident who was paying just a little over Rs 7,000 every month is now paying just 25% of that cost. That is a saving of 75% every month. With the onset of summers, and ACs set to run at peak, the electricity bill will only go northwards, however, with a 5.5 kW solar system on his rooftop, the resident is confident of saving even more. What is even more interesting is that the said resident has not even opted for subsidy and gone ahead with imported modules which have been in field tested and trusted for years on end. It is due to this that his generation is uniform and stable and he is able to generate a 20% return on his investment. So get your solar rooftop solution soon and help us to achieve the target of making Green Gurgaon, Solar Gurgaon. MYSUN is one of the top solar company in Gurgaon and provides the best solar rooftop solutions to the customers in the field of reasonability, accessibility and reliability. To know more about going solar in Gurgaon or if you have already made up your mind and would like to discuss the project, make sure you start your solar journey by hitting the link below. You can always call our solar advisors at +91 98731 67009. Sir,please tell about Jammu(J&K) State.